The challenge of cooking a tasty and memorable Passover Seder meal usually lies in the dessert course, so I'm very excited with my latest matzo creation! 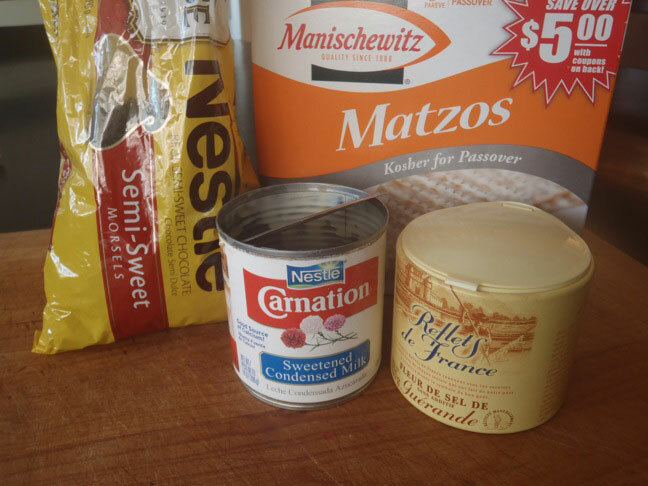 For Passover, you don't use any grains that can ferment and leaven when mixed with water. Matzo is a cracker-like, unleavened bread, and — in my opinion — the perfect canvas for a variety of sweet delicacies! 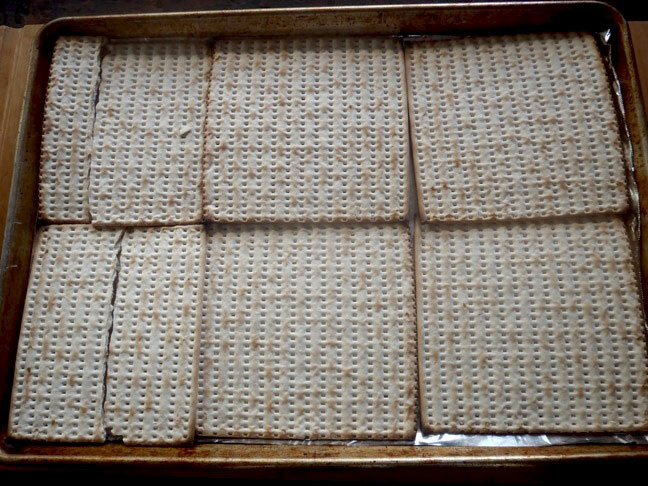 Cover a baking sheet with foil or parchment paper, and lay out the matzo sheets in an even layer. You will have to break a couple of them to fit. 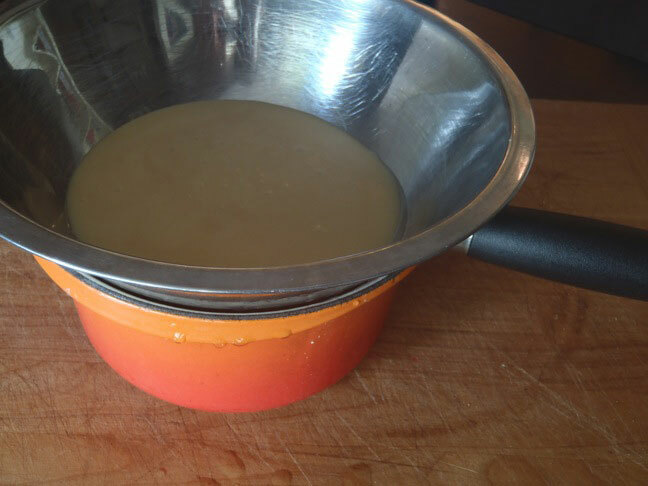 When the dulce de leche is done and while it's still warm, drizzle all of it over the matzo and use a flat-bottomed spreader to make an even, smooth layer. Sprinkle it with Fleur de Sel and let it set at room temperature for at least 5 minutes. Add the chocolate chips evenly over the top of the now somewhat solid dulce de leche. Put it in the oven for until the chocolate chips melt, about 4 minutes. 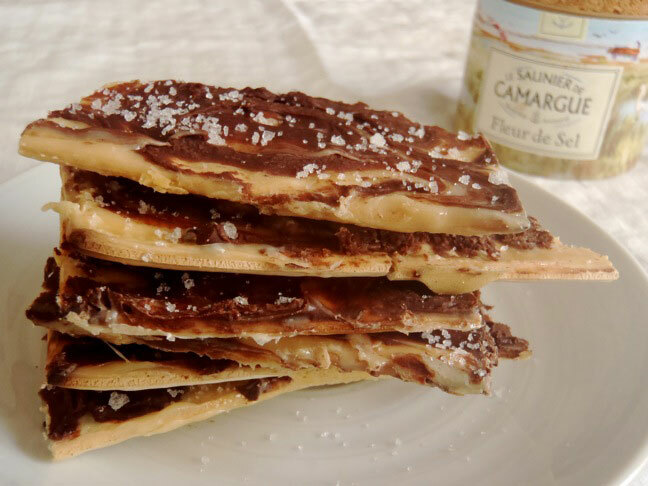 Use the flat-bottomed spreader to smooth and swirl the chocolate over and into the dulce de leche. 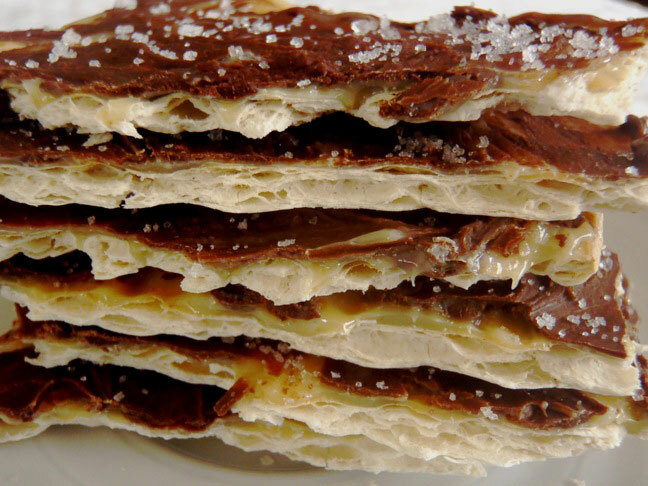 Sprinkle the top with a bit more of the Fleur de Sel. Let this set up at room temperature, then break each crackers into about 9 pieces.